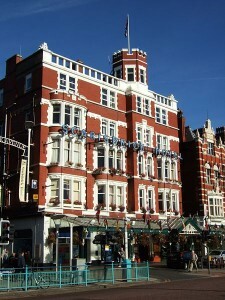 The famous Scarisbrick Hotel on Southport’s plush Lord Street played a vital role in the life of James Lawrence Isherwood. Wigan was certainly his first love, but Southport came a close second. His association with the Scarisbrick Hotel began when he met the hotel’s owner, Frank Carey. Along with his wife, Frank liked Isherwood’s paintings and the artist liked the couple and the style maintained in their hotel. Now living on the Isle of Man, Frank is proud of his collection of “Ishy” paintings and has a file of letters from Jim Isherwood, together with photos of happy memories. After being released from Billinge Hospital following drink problem treatment, the artist went to stay at the Scarisbrick Hotel, and began painting with renewed vitality and energy. His room was crowded with wet works of art. Within a handful of weeks he was planning a show at the Scarisbrick where he was more than glad to meet attractive Pat White from the Wirral. She too painted and they became firm friends. The exhibition was a moderate success and it wasn’t long before Jim went to live at Pat’s impressive home, Roseacre, at Neston on the Wirral. He took the attitude that he was “master of all he surveyed.” Meanwhile the Isherwood home on Wigan Lane stayed empty and neglected. Isherwood was delighted when “The Isherwood Suite” was opened at the Scarisbrick Hotel - and the impressive room was festooned with many superb Isherwood paintings belonging to Mr and Mrs Carey. Bronze busts of Jim and Pat – who fooled people into thinking they were married – rested in the Hotel foyer. After some time, the relationship between the ever-temperamental Isherwood and Pat deteriorated. There were many disagreements. It seemed they couldn’t live with each other. And equally they couldn’t live without each other. Life became difficult for all concerned and for a while Isherwood went back to the Scarisbrick Hotel. Then he returned to Wigan – alone, unhappy and telling sob stories to all who would listen. He stayed friends with the artist for many years, always convinced that the work of the Wigan master was unique. Frank believes that without a shadow of a doubt, James Lawrence Isherwood lived life to the full and, even though there were bad times, he wouldn’t have altered anything.